Timed Dual Entryway Airless Foam Sanitizer | Lafferty Equipment Manufacturing, Inc. The Timed Dual Entryway Airless Foam Sanitizer is an automated foam applicator for projecting sanitizing chemicals on to floors of 6' wide double door entryway floors to prevent cross contamination, without compressed air. 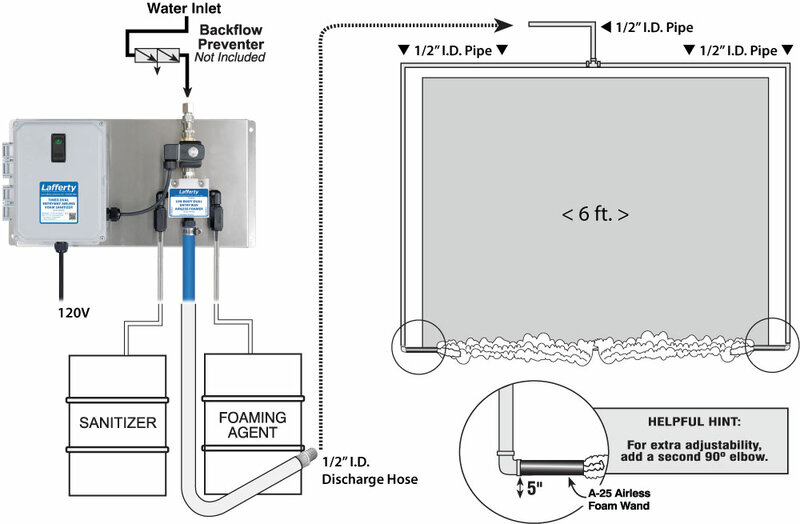 When activated, this venturi injection system uses city water pressure (35 - 125 PSI) to draw and blend chemical concentrate into the water stream to create an accurately diluted solution. The solution flows through the discharge hose to the airless foam wands which draw in atmospheric air to create wet, clinging foam. The system timer is user-programmable to meet the needs of any facility. See Catalog 6 for other entryway configurations including push-button-activated, electric-eye-activated, compressed air assisted, and more!